Raspberry Pi Notes: Nook - e-reader / Pi Display - Attempt 2. Nook - e-reader / Pi Display - Attempt 2. 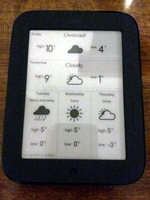 Then, on the Nook, I created a directory for a custom screensaver - /screensavers/weather. The nook (rooted as previously with nookmanager) runs a program 'FolderSync' which periodically (every 6 hours) syncs the output directory on the RPi with the screensavers/weather directory on the Nook. Finally, the Nook is configured so that the screensaver kicks in after 10 seconds by modifying the settings.db from http://forum.xda-developers.com/showthread.php?t=1721665. # The first image link is for the current weather, which we don't want. # AJR - try init display - output to PC screen for testing. # AJR - try to output display instead of converting to raw. The only irksome part I've not managed to work around is that the screensaver does not automatically update when the new copy of the image is sync'd. - I have to push the 'n' button on the nook to wake it, and then the new weather is displayed when it goes to sleep again (after 10 seconds).